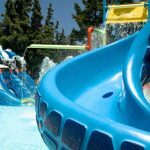 There are 4 main Waterparks on the island of Crete. Three of the Waterparks are based on the East of Crete, the other is based near Chania in the West. 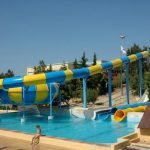 Waterparks offer a great day out for any family or group of people and you will find the ones in Crete very safe and secure. 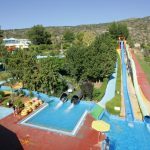 If you after a guide on the best waterpark to pick for where you’re staying then look no further. 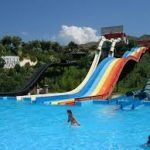 This covers the main waterparks in Crete with some featured photos and a link to book tickets online if you want to. Most of the parks have onsite facilities for showers, locker rooms and small cafes to buy food or drinks. You pay 1 fee to get into the park for a certain amount of time or all day passes. 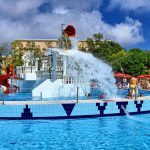 Below you will find information on the four main waterpark’s in Crete, there are 3 main Waterpark’s on the East of Crete including Watercity, Star Beach and AquaPlus and on the West side of Crete you will find Limnoupolis. We have added prices where we have found them but please be aware that prices are always subject to change. You can buy the tickets online through the main website’s and some even have discount coupons and vouchers that you can print off to get discounted entry through the summer. 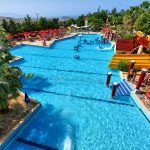 WaterCity is the largest Waterpark in Crete, and is located in the Anopolis Mountains, just up from a resort called Kokkini Hani. You can get to this park via a taxi or buy the coach transfer and tickets at local travel agents in your resort. 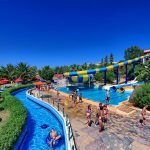 The rides on offer in this Waterpark are the best in Crete, with the cyclone body slide, kamikaze`, sidewinder, lazy river ride and turbo cyclone to name a few. There are large areas to sunbathe and relax if you want to let the children enjoy the pools. There are facilities including changing rooms, lockers, fast food cafes, ice cream stalls and gift shops and much more. 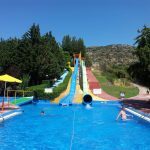 If your on the east of Crete the definitely visit WaterCity for a great day out with friends or family. Acqua Plus is located just outside of Hersonissos, on the road to Kastelli. A medium size Water park it is set in a very nice location with quite a number of rides and pools. Tickets for this can be bought in resort from travel agents, I think at last price they were 12 euros, plus 6 euros for coach transfers. A taxi from Hersonissos will get you there for 10 euros. Everything in the park is charged to the armband you are issued at the start and you pay on leaving the Waterpark Give yourself plenty of time to leave as there can be queues to pay and leave at peak times. 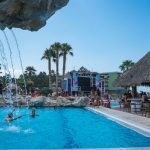 This small Waterpark prides itself more on the atmosphere and other facilities including club days, bungee jumping, go-karts club nights and foam parties. There are very few actual slides here but plenty of swimming pools. The park is free entry, although you do have to pay for a few rides and the extras like Bungee Jumping. The drinks and food are reasonably priced also. 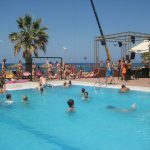 You can get free transfers from Hersonissos, Stalis and Malia at certain restaurants and travel agents. Limnoupolis is located on a beautiful, emerald area 8 km from the city of Chania near the community of Varipetro. 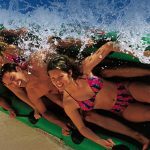 It a good sized Waterpark and offers some thrilling rides for all the family. 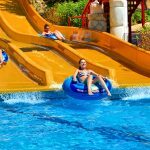 Entrance fees to the Waterpark are quite reasonable at 20 euros per person and half the price for children. 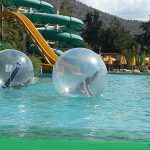 If your out and about staying in or around Chania then you must take a trip to Limnoupolis Waterpark.